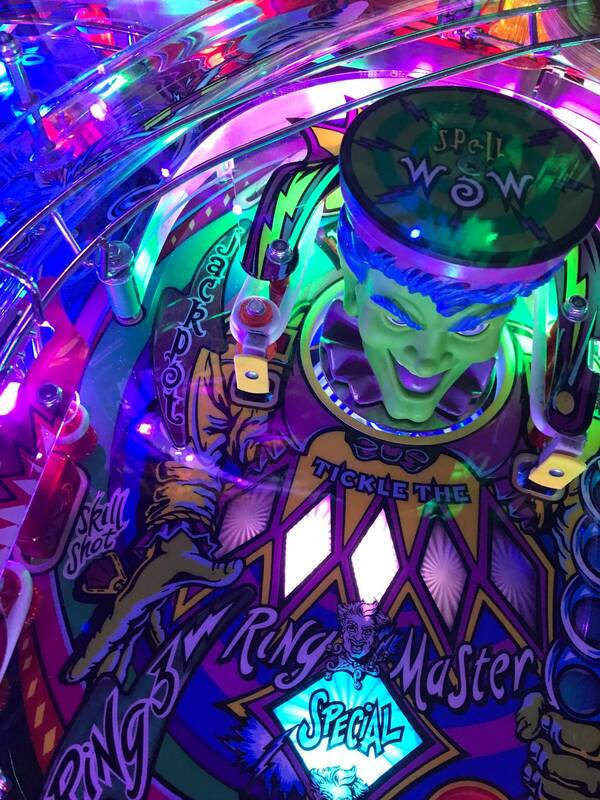 » Forum » All Pinball » Cirqus Voltaire remake? Hi all, do you think they will ever remake Cirqus Voltaire? It's a pretty rare game and fun to play in my opinion... Thanks!!! Haha.... love your avatar I would suspect if it is a popular pin and highly regarded, pretty good chance CG will consider it for a remake! I would love it if there was one. I think it's an excellent game. Considering this title didn't do well when it came out and ended up being a close out pin, I wouldn't bet on a CVr for a very long time if ever. I would agree it will be at the bottom of the list due to previous blow out sale. Agreed. As much as I wish they would, I don’t think they will anytime soon. What company would you expect to be the ones who would remake it? I don't know that it really had much of a chance when it came out in late '97 into a flatlining location scene. Sort of like Cactus Canyon later, and CC is getting remade. I don’t think that it’s performance in 1997 matters. What matters is the demand now. It’s not clear if 1,000 LEs would sell, etc. I love my game, though and I think that most people simply have never played one. Possibly and I like CV. CC is a games that didn't have a chance though, it came out in very small numbers at the end of pinbal and it was severely unfinished. CC has became a high valued pin due to "rarity" and that seems to be what the remakes are chasing, same as Stern with their Vaults. When a pin commands a high value and somebody has the ability to reproduce that title as a remake or vault, why wouldn't they make another run of it and collect on that opportunity? It's kinda funny if you think about it. Anytime a vault or remake is announced or anticipated, people start dumping them and the selling price is drastically reduced (makes sense). I can't wait for a Tron Vault! I know Theater of Magic is first. I suspect TOTAN would be next. I guess CV would be far off if it ever gets remade. The collecting world is full to the top with stuff that didn't sell well when it was released and then became a red hot collectable. Cars, guns, guitars, record albums, you name it. I was probably the only person in the USA who was dropping quarters into Atari I, Robot when it was in arcades, now it sells for $4,000+. That's why the price tag is up there with TZ, TAF, ToM and other blue-chip 90s pins. Need them to remake this title so the market will load up with Cvs and I can get one at a great price! Theater of Magic is next, followed by Monster Bash and then Cactus Canyon. So I'd have to say TOTAN and CV are pipe dreams at this point. They could hardly give this machine away when it was new, so yeah a $9000 remake makes total sense. I think they should remake it, add more to the game like AFM LE, I would buy it and put it next to my original.I was so happy 10yrs ago to finally bring one home ,games beautiful.I think B/W games in that era still the best . I have a Sample version of Cirqus Voltaire restored by Christopher Hutchins of High End Pins that I will be putting up for sale very soon. Pictures can been seen on IPDB and identified under my name, Kim Mitchell as the photographer. Contact me privately if you have interest. Donation to Pinside will be made for sale. Back on topic: CV was not on the recently announced list of likely remakes. I've never looked into the guts of a AFMR but would the screen they use in that game even fit in a CV? Obviously they could use the same type of LED panel that ColorDMD does (looks pretty awesome) but making it any bigger or really enhancing it might be more problematic with this title than others? That won't happen. The one that's in there barely fits as it is. I really don't see them remaking this title. There are a lot more games they can remake that are easier and can make more money. I personally would not want the display in the backbox. It would have to be below like originally made. You have made a statement like this a few times. How are you so sure? Is this just your speculation or do you have a reliable source? My source tells me MB is next, as in it was supposed to be announced at TPF this year but was delayed. I'm not being snarky in anyway, just trying to figure out how you are so sure. By the way, I'd love to come up and see your collection! You also need to sell me that Iron Maiden I have been asking you about! Will be interesting to see what this game will sell for.New games are a dime a dozen,expensive but easily had.This is rare and spectacular game. i think he's full of bologna, every insight ive heard tells me different too. There are a lot of #CV machines up for sale at the moment. Does this mean people are saving for a new Deeproot machine? I am interested, but the prices feel a bit high when so many are coming up for same. About the same thats always for sale imo ...prices are high on some but they are cq huo with nice mods and the others are about right for the condition. Nice condition Cv have been in the 7-8500 range since ive been in the hobby (4+years). I think the cq ones with mods are just following the upward trend of A list b/w pins (like tz, taf, ij, wh20) and many others. Cv has much much lower production run than most b/w pins also. If it is remade it will be much further down the line and many many years from now so i wldnt worry about that. And new play fields mean that you can start finding restored examples now and boy does that game look good with a fresh playfield! LOL.....I just now seen this. Yes at the time (over a year ago) my information was correct but obviously things changed for whatever reason and MBr pulled ahead. My contact was extremely close to these projects but I've not talked to him since, even though he is a good friend of mine and someone I can trust. The IM is here feeling lonely and waiting for a visit. This makes sense when the vault is priced lower than the original such as IM VE which was sold at $4600 nib when used were $5600. With Tron you’d need to pay nib $5600+ ( likely ) then drop $1000 in mods to get an equal pin to many huo Tron on the market. Someone with huo Tron Pro for sale at $6200 with mods won’t need to adjust price if Tron VE starts at $5600 with no mods. With AFM the original ones were already less than the LE so they added stuff like topper, color large screen, shaker, color changing saucers. I think that the only way CV will be remade is if CGC goes catalog. I think that would be really cool for a company like PPS/CGC to catalog the remake program. You just order what machine you want and they pump it out. It seems feasible since the B/W DMD games were so similar in construction. Just have PFs, decals, translites, toppers ect... all ready as the cabinet progresses down the line. Maybe have 12 titles to choose from. Heck maybe even go automated and have them all built by robots! Agreed. I have one now and the differences are pretty neat. I found that if you do a small modification to the post and rubber on the left of the Ring Master, you can eliminate the ball stick issue with the Prototype (skinny) Ring Master. He really represents the sample and prototype games IMHO. Now you can use him and not have to remove the glass when the sticks in his ruffle. Change out the straight post for a double star post and stretch the rubber out to the star post. It stops the ball from sticking there and no permanent mods to the game. Great tip! I’m going to have to do that. CV is a top collector game now. it didn't have poor sales because it's a bad game, it's actually excellent. the high end of all collector markets are populated by the stuff that DIDN'T sell well. Especially if the item in question is very well made or unusual in a way that grabs the collector's imagination. Ball traps are part of CV charm! CV is worth what it is in part because it is rare. MB made sense to remake, they made more and it sells for more as an original. Why remake a game that they made 20 percent less, is worth about 25 percent less? Market is saying its not as desirable. This comparison gets worse if you compare it to MM especially since they made 4k of those and they were going for quite a chunk more before the remake.